The islander of Norfolk Island annually celebrate Bounty Day on June 8. This holiday celebrates the arrival of the islanders by the HMS Bounty to the island. HMS Bounty sailed in the Pacific Ocean to acquire breadfruit plants and transport them back to Britain, but this mission was never completed. A mutiny broke out on April 28, 1789 and the ship was taken bloodlessly. Sailors loyal to the captain of the ship sailed to Pitcairn Island and settled there. They burned Bounty in order to prevent possible escape from the island. Pitcairn Island became a British colony in 1838 and Norfolk Island was granted them in 1856. The first islanders arrived on Norfolk Island on June 8, 1856 to set a colony there. 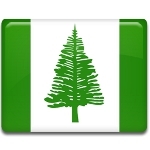 Prior to that time Norfolk Island was a penal territory, it was granted to the Pitcainers as a home by Queen Victorian and they created a local government there. Celebration of Bounty Day starts off with a re-enactment of the landing of the islanders down at the Kingston Pier. Then they are greeted by the administrator of the island and his wife, march to the cenotaph to lay wreathes in remembrance and to the cemetery. Next they proceed to Government House where one family is awarded the title of Family of the Year. Then everyone returns home to prepare for Bounty Ball.